Finding a unique species in the jungle may have been normal. But, what if the species was discovered in a restaurant? 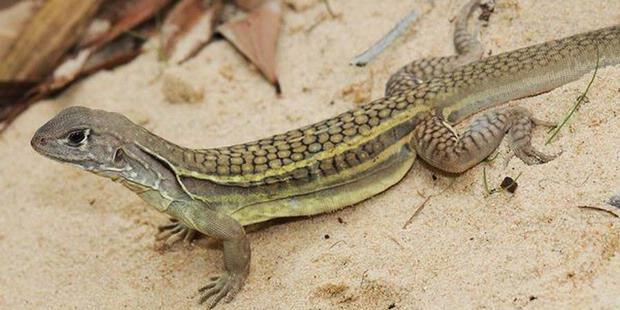 Father and son pair who are both researchers reptiles, and Jesse Lee Grismer Grismer, successfully identified a new species of lizard found in a restaurant in Vietnam. Lizard is a female and able to reproduce asexually, aka can breed without mating. Name of lizard species found were Leiolepis ngovantrii. Actually, this is not the first time lizard species had been encountered. "The people of Vietnam have been making daily food. The diner also has made it one of the dishes that are sold," said Lee, who became a reptile expert at La Sierra University in Riverside, California. The research began when fellow Lee, Ngo Van Tri, the Vietnam Academy of Science and Technology, see the lizard species in the diner. He feels there are discrepancies in these lizards because they all have the same color. He then photographed and mengrimkan photo to Lee. Lee then came to Ho Chi Min City with Jesse. Having had run out of stock when looking at a diner, a father and son eventually managed to collect more than 70 lizards. They identify it and finally found the fact that all species of lizards were female. Lizard species that reproduce all of these female parthenogenesis. With the reproductive system, the lizard is able to release her eggs are already cooked and "merge" with another egg that she production. The combination of two egg cells that form a new individual. Lee said he found the lizard may be a hybrid of the maternal and paternal lines from two different species are interdependent, a phenomenon common in the transition zone. "Thus, the species is in an area and other areas within a certain time to meet and reproduce to form a hybrid," said Lee. Once the lizard mitochondrial DNA testing, Lee found that the maternal line was a species of lizard Leiolepis guttata. Meanwhile, line paternalnya unknown because of the difficulty to identify paternal lines with mitochondrial DNA. The results of this study published in the journal Zootaxa on 22 April 2010.